They’re off! At midday the gun echoed over the racecourses in the Gulf of Saint Tropez for the start of the first day of inshore racing. A southerly wind between 8 and 12 kn and calm water, with the fleets engaged in coastal races (Groups A and B) and windward/leeward races off the beaches (Group 0, Wally and ClubSwan). The TP 52 Freccia Rossa, which had dominated the 2017 edition, scored the first win of the day. There’s an irresistible magic of numbers in this 2018 edition, starting from the coincidence of the number of entries (241) with the length of the long race (241 miles). The total length in metres of the entries would form an imaginary rectangle of 3,380 m x 980 m, with an area of 331 ha that would easily hold about 11,000 tennis courts! The average length of the yachts entered is a little more than 14 m, with an average crew size of about 10, meaning a peaceful invasion of more than 2500 yachtsmen in the town of Saint Tropez. Today at midday the coastal races started with the fleet divided between two main courses: the “little ones” of groups A and B (boats from 9 to 18 m) raced over a coastal course of 19 miles (31 for Group A) while the bigger ones (from 18 m up) raced twice around the marks on the course of the beach of Pampelonne. Here the big Maxis in Class 0, the Wally 100s and the ClubSwan raced in a tight rhythm on 1.5 mile windward/leeward courses for the ClubSwan and 3.5 mile course is for the others. The day’s results: in Group A (IRC), the Russian TP 52 Freccia Rossa dominated, while in ORC the day’s race went to the Solaris 50 Paola 3. In Group B IRC, a successful race by Juke Box and the XP33 Controcorrente in the ORC division. In Class 0, an unbeatable MiniMaxi 72 Cannonball, winner of both the days races. 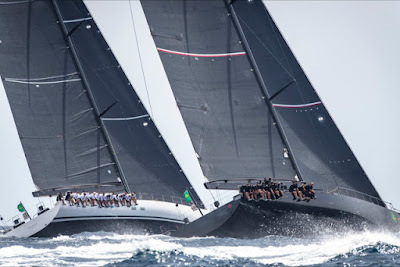 The Wally 100 Galateia won in its Class in front of Magic Carpet Cubed and Tango. On the same Pampelonne course, winner of the day, the ClubSwan 50 Cuordileone. The day finished with a cocktail of the International Maxi Association, present in force in Saint Tropez also because of the institution of a prize for the best result among the Maxi Yachts. Since 2015 the IMA Mediterranean Maxi Offshore Challenge has been promoting the participation of maxi yachts in the most prestige offshore races in the Mediterranean. The winner of the IMA Mediterranean Maxi Offshore Challenge will be the maxi that scores the best results from at least three of the five races on the circuit. The prize will be awarded in Porto Cervo in September 2018 during the Maxi Yacht Rolex Cup. Updated rankings on www.rolexgiraglia.com – photo gallery and videos on the YCI Facebook and Instagram pages.